Interesting times, 1969. Ferdinand Marcos was elected for a second term as president of the Philippines. The Beatles performed as a group for the last time on a London rooftop. Man made the first moonwalk preceding the Michael Jackson version. And Gloria Diaz was crowned Miss Universe just days apart this incident; prompting then President Nixon to state “The US conquered the moon but the Philippines has conquered the universe”. It was also the year Kowloon House started out as a small teahouse serving dim sum. Over the years it had expanded into a full on Chinese restaurant with banquet rooms and was quite popular as a venue for weddings. It’s luster has waned from it’s heyday a couple decades ago. Today, I think people would associate Kowloon House more with its numerous 24 hour dim sum take-out counters spread out around the Metro. They serve quite a bit of slapdash fried dumpling and rice meals now but I just stick to the good old reliables. 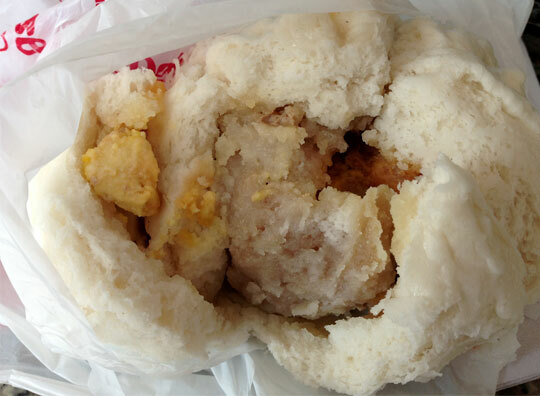 Probably the most famous of their items would be the jumbo siopao (aka Jumbo Pao). Huge and hefty; filled with ground pork (bola-bola), chicken, lap cheong and salted egg. The bun has this intoxicatingly sweet aroma and has a texture more cakelike than bready; which makes it easy to break apart in soft white tufts. You do not muddle this up with that sweet brown syrup people douse most commercial asado siopaos with. But you dab each bite with their signature hot sauce ; very nice red pepper flavor and a sriracha like consistency. (*Actually, you can purchase this sauce in some groceries; it’s bottle labeled as Sunshine Hot Sauce.) The Jumbo Pao is a classic. And at P60 for a mammoth serving; a very good deal. If this doesn’t fill you up, then, I don’t know. But while all satellite branches carry the steamed items, only the main branch along West Avenue carries their baked items. The buchi/butchi, for example. And their version of custard pie. 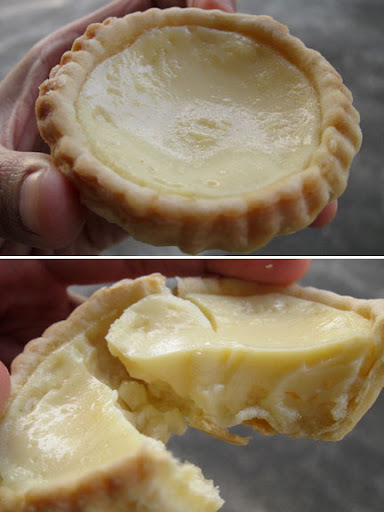 Very similar to a Portuguese style egg tart, but not as decadent. The crust is just as flaky. And the filling is like that of an egg pie but silkier and smoother and is only mildly sweet. Interesting to point out the pastry has a slight saltiness to it that works very well with the custard. Again, at P60 for an order you get two pieces of these. My favorite would probably be the chicken curry pie. 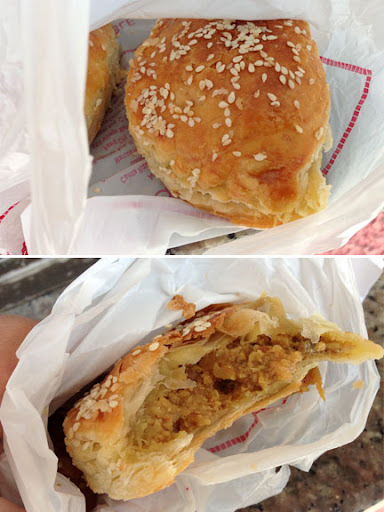 A salty/sweet, chunky Chinese style curry covered in this sesame seed studded puff-like pastry. One piece is generous enough, but again a P60 order comes with two pieces. I love how the flaky crust gives way to a deliciously comforting savoury center. In the wee hours of the morning, maybe after a little drink involved, this would definitely hit the spot. But would pose quite the conundrum as, after tucking into it, the spiced, stew-like filling will definitely get you thinking…”This would go so well with a beer.” So well. With takeout counters all over Metro Manila. My favorite is the Chicken Siopao. I enjoy it because of the Cake like texture (as you have described) plus the wonderful pairing with old school Sunshine Hot Sauce. lets have a moment of silence for their park square branch. may it rest in peace..